A couple of weeks ago the audio cable that my girlfriend and I were using with an old iPod speaker dock bit the dust. We continued to use it for a few days because we could usually get the cable to work by wiggling it around for a minute or two. But eventually this extra step became too much of a hassle and it was time to either buy a new cable or get a new speaker dock. The speaker dock we were using was the iMode Clock Radio Docking Station for iPod which has a dock connector on the top of it, but because it wasn’t made with the iPhone in mind our iPhone 3GSs are just too tall to fit underneath the speakers. I considered just buying a new audio cable to use with the iMode’s auxiliary input. This would have saved me some money but using an audio cable like that was a bit kludgy and honestly I was tired of seeing that ugly speaker dock in my kitchen. So, last week I saw the Altec Lansing Octiv Mini on Jack Threads and decided to do a little investigating. I liked the Octiv Mini and it was priced well on Jack Threads but wanted to read some reviews. Not too far into my research I discovered the Octiv Duo which had a similar styling to the Octiv Mini but featured two dock connectors on top and a remote control. Since the speaker dock is used by both my girlfriend and I, I thought it would be perfect for us. We often find ourselves swapping the audio cable between our two devices so that we can play a bit music from both of them. The Octiv Duo supports a neat little app by Altec Lansing called Music Mix that let’s you mix the music from both devices. Just plug in two devices (iPhone, or iPod) open the app on one them and hit play. The Octiv Duo will automatically switch between the two devices to give you a mix of music from both. Music Mix gives you a slider so that you can choose how much music you want to be played from each of the two devices. The biggest downside to Music Mix is that there is no way to control what music it plays from the devices, there’s no way to pick a playlist, artist, or genre, it just shuffles the entire music library from both devices. I would like to see the ability to choose what music it plays but I don’t know if that’s something Altec Lansing is working on. Regardless, I have a feeling the Music Mix app will be incredibly useful when we have a few friends over with iPhones or iPods. There is also an alarm clock app that works with the Octiv Duo. But, I didn’t do any testing beyond opening the app and tapping around a bit. It’s an attractive application but I don’t have any use for it since the speaker dock is going to live in the kitchen. The Octiv Duo is an attractive little speaker dock. 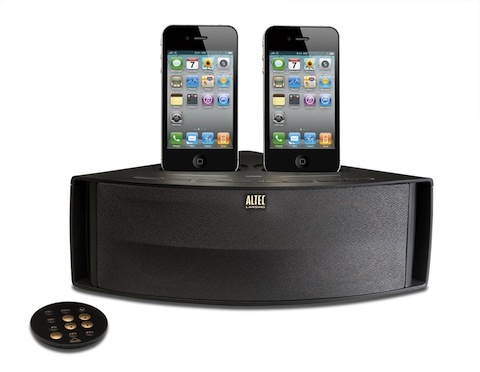 The front features two speakers hidden behind a dark grey cover with the Altec Lansing logo located along the top. The top of the Octiv Duo has four buttons: power, source, volume up, and down. The two dock connectors are in the center of the device and in front of them are three orange LEDs that indicate which source is selected. The back of the speaker dock has a place to hide your remote that is held on by magnets, an auxiliary-in jack, power, and a USB port to charge another device, such as a digital camera, iPod shuffle, etc. The Octiv Duo is light but won’t accidentally slip around on your countertop thanks to the four rubber feet on the bottom. It’s designed quite well and I especially love that its wedge shape makes it easy to stick in a corner to keep it out of your way. The remote is small and feels nice in the hand but nearly half of the buttons are unusable with anything but click-wheel iPods. This leaves iOS device owners with just power, source, volume up/down, next, previous, and play/pause. It’s everything that you need but it would be nice if the click-wheel-specific buttons were consolidated into one area at the bottom of the remote rather then in the middle of the remote. In one of Altec Lansing’s promotional videos for the Octiv Duo they mention the ability to keep the remote on your fridge but in my experience the magnet in the remote is barely strong enough to keep it where you put it. I’ve found that the best way to put it on the fridge is to hold it on both sides and set the back of it on the fridge evenly, any other way resulted in the remote sliding down the face of my fridge onto the floor. I also don’t expect to get much use out of the USB port on the Octiv Duo. This may change in the future but I don’t have any devices that I use often enough for me to need to plug them into a dock in the kitchen. I did try to charge my iPad and Kindle with it for testing purposes but unfortunately the Kindle’s USB cable is too wide for the port on the Octiv Duo and the USB port doesn’t output enough power for the iPad to charge with. The sound quality from the speakers is much better than I expected. I’m no audiophile but can tell the difference between crappy speakers and good speakers. These are good speakers and they sound leaps and bounds better than the old iMode speaker dock I was using. One huge benefit to having two dock connectors on the Octiv Duo is that our old iPod touch that’s been nearly abandoned can live in the second dock connector when we’re not mixing from two devices. This also means that we can run Airfoil Speakers on it and Airfoil on the iMac so we can listen to live podcasts in the kitchen. It’s also very handy to have a speaker dock that can charge two devices at once (or three with a USB cable). My sister and brother-in-law use the heck out of their iPhones. They have a one-year-old daughter and are taking pictures and recording video all day. And as a result, they’re iPhones are nearly dead much earlier in the day than most. They already have a speaker dock next to their couch that they use primarily for topping off their battery during the day, but I expect there are times when both of them need a little more power and the extra dock connector in the Octiv Duo would come in handy. I’m really happy with the Octiv Duo and am glad that I decided to buy a new speaker dock rather than going the cheaper route and getting a new audio cable. The Octiv Duo has already seen an incredibly large amount of use in the short period of time that we’ve had it and I’m sure it’ll get a ton of use during it’s life span. I’ve used a few different speaker docks at friends’ houses before and this is by far the best, in terms of sounds quality, features and ease of use. I have a feeling that my sister and brother-in-law will be very tempted to go out and buy one once they see it. If you have two or more devices in your home that have a dock connector I’m sure you’re very interested in this device and I couldn’t recommend it more. Altec Lansing’s site is currently selling the Octiv Duo for $99.95 but it’s also available from Amazon for about $65, you’ll save a bit of money and I’ll get a kickback if you buy it through that link.